As the Carmel Clay Public Library celebrates 20 years in its building at 55 4th Ave. SE in 2019, its director reported on a record-breaking 2018 at the Feb. 4 Carmel City Council meeting. 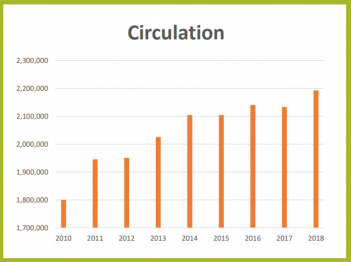 Circulation was at an all-time high last year, with nearly 2.2 million items checked out. “That’s really an astounding amount for the size of this community,” said CCPL Director Bob Swanay, who said he’d expect to see numbers at a quarter or half of that amount in a city Carmel’s size. Approximately 10 percent of the items circulated were in a digital format, a number that’s more than doubled in the last five years. The library soon expects to offer Kanopy, a service that streams independent and documentary films, to cardholders free of charge. 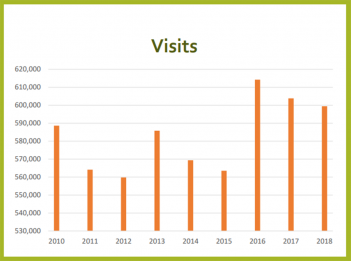 The mobile library also saw growth in 2018, with a record 21,614 items circulated at a record 1,144 stops. The library’s Digital Media Lab at 23 E. Main St. drew 17 percent more visits in its second year, and 3-D printing volume increased approximately 93 percent, in part because the lab expanded from one to three printers. Because of the interest in 3-D printing, the library will host a 3-D Printing Expo from 10 a.m. to 3 p.m. March 2 in its program room. Swanay also outlined major projects planned for 2019, including the library’s first branch, which will open at 12770 Horseferry Rd. in a 3,500-square foot building that previously housed a grocery store. He said he is hoping the branch will be open in the fall but is confident it will be ready by the end of the year. “This is going to be one of the more visually interesting branch locations that I’ve seen,” said Swanay, who displayed new renderings of the building’s planned interior. The library also is working through major renovations at its main campus, which will likely include moving the often-cramped program room to the south side of the building near the parking lot and moving the teen area near the current site of the program room. Swanay said the renovation project is in its early phases and that he hopes to update the city council on more specific plans when they are available.